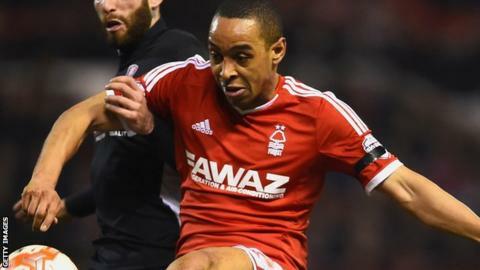 Nottingham Forest moved up to eighth in the Championship as they inflicted a first defeat of the season on Birmingham City at St Andrew's. In a game of few clear-cut chances, Dexter Blackstock's second-half goal proved to be the difference. He bundled home from close range after Jamie Ward ended an excellent run with a calm ball across the face of goal. Demarai Gray's volley wide with 20 minutes left was the closest Birmingham came to an equaliser. The result sees Forest draw level with City on 11 points in the Championship, with seventh-placed Birmingham one spot above their opponents by virtue of goal difference. Birmingham's Jon-Miquel Toral had the only effort worthy of note in the opening half when he shot just over from 16 yards out after Jacques Maghoma lost control of David Cotterill's cross. But the game came alive after the break, with Clayton Donaldson's 50th-minute header going over the bar after an excellent ball from the right by Cotterill. The goal came soon after as Ward got beyond Paul Caddis and ended a superb run with a ball which Blackstock converted to get his first goal since the final day of last season. The visitors then put the shutters up as Birmingham failed to test Dorus De Vries in the Forest goal. Gray's volley wide of his left post after Cotterill's free-kick fell invitingly to the youngster was the only time the home side worried Dougie Freedman's men. Birmingham City manager Gary Rowett: "Forest set up to frustrate us and block us out of the game. They used Henri Lansbury in front of the back four in a destructive role which I thought he played really well. "Sometimes you have to hold up your hands. The most disappointing thing for me was the way we tried to chase the game in the second half. "We became a little frantic and a little bit too hurried and desperate on the ball and did not show enough quality." Nottingham Forest manager Dougie Freedman: "In the end I don't think Birmingham can complain about the result. "Over 95 minutes we only gave them one chance and we deserved to win the game. "There is a long way to go but there are signs there and get the budget right we will get where we want to be in the future." Match ends, Birmingham City 0, Nottingham Forest 1. Second Half ends, Birmingham City 0, Nottingham Forest 1. Attempt saved. Jonathan Spector (Birmingham City) right footed shot from the centre of the box is saved in the bottom left corner. Assisted by Michael Morrison with a headed pass. Foul by Nicolai Brock-Madsen (Birmingham City). Corner, Nottingham Forest. Conceded by Michael Morrison. Attempt missed. Ben Osborn (Nottingham Forest) left footed shot from more than 35 yards is close, but misses the top left corner. Assisted by Ryan Mendes. Offside, Nottingham Forest. Ryan Mendes tries a through ball, but Chris Burke is caught offside. Attempt missed. Ryan Mendes (Nottingham Forest) right footed shot from outside the box is high and wide to the right. Assisted by Ben Osborn. Attempt missed. Kelvin Wilson (Nottingham Forest) header from the centre of the box misses to the right. Assisted by Ben Osborn with a cross following a corner. Corner, Nottingham Forest. Conceded by Maikel Kieftenbeld. Corner, Birmingham City. Conceded by Henri Lansbury. Attempt blocked. Matt Mills (Nottingham Forest) header from the centre of the box is blocked. Assisted by Ben Osborn with a cross. Corner, Nottingham Forest. Conceded by Paul Caddis. Corner, Nottingham Forest. Conceded by Jonathan Grounds. Attempt saved. Chris O'Grady (Nottingham Forest) right footed shot from outside the box is saved in the centre of the goal. Assisted by Chris Burke. Attempt missed. Demarai Gray (Birmingham City) right footed shot from outside the box misses to the left following a set piece situation. Substitution, Birmingham City. Nicolai Brock-Madsen replaces Jon-Miquel Toral. David Cotterill (Birmingham City) wins a free kick on the right wing. Substitution, Nottingham Forest. Chris O'Grady replaces Dexter Blackstock. Substitution, Birmingham City. Demarai Gray replaces Jacques Maghoma. Offside, Nottingham Forest. Ben Osborn tries a through ball, but Ryan Mendes is caught offside. Substitution, Nottingham Forest. Ryan Mendes replaces Jamie Ward because of an injury. Delay in match Jamie Ward (Nottingham Forest) because of an injury. Offside, Birmingham City. Stephen Gleeson tries a through ball, but Paul Caddis is caught offside. Corner, Birmingham City. Conceded by Eric Lichaj.